Taking a walk in the woods for relaxation or exercise may not seem like a therapy, but being in a forest can improve your mental and physical health in very unexpected ways. Studies show that simply being present within the healing essence of nature enables most people to reduce stress, lower blood sugar, improve their immunity and concentrate better ... to name just a few of the benefits! Forest therapy's healing effects arise from the soothing aromas, colors and sounds of the natural environment. When people are more relaxed in their surroundings, it not only has a positive influence on overall health, the phytoncides emitted from certain plants and trees can have a significant impact on health-related issues such as lowering blood-pressure and easing pain. Phytoncides have even been shown to produce anti-cancer effects! 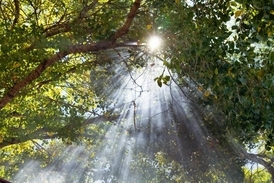 Please see our wellness programs to learn more about the types of forest therapies we offer. Experience for yourself the rich scents, pleasant scenery and healing atmosphere of the forest for balancing mind and body. Although it's a relatively new field of holistic medicine here in the west, forest therapy is a well-established practice in many Asian countries like Japan and Korea. In fact, many Japanese companies now include forest therapy in employee health care benefits. And, many wellness programs are offered to employees with free check-ups that take place in the forest!